This time I used Golden Delicious apples. 4 apples, 6 minutes caramelizing, all-purpose flour. 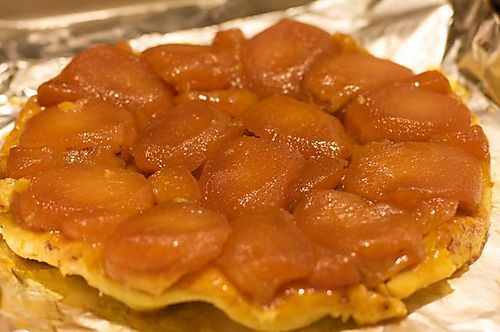 Having put together a satisfactory result (I've replicated the more blonde photos that appear if you search for "Tarte Tatin" on Google Images), what would be the purpose of writing another recipe? The trail-and-error experimentation I went through to arrive at this tasty yet now boring tart was not because of a dearth of good recipes, but rather because I had to get to know the recipe. Apparently getting to know a recipe, for me, involves significant variations that are clearly not called for in the recipe: different fruit, sugar, flour, and proportions. (If stupidity is doing the same thing and expecting different result, what is doing something different and expecting the same result?) It was through this daft variation that the necessities of the recipe revealed themselves. Pears instead of apples and honey instead of sugar are fine. 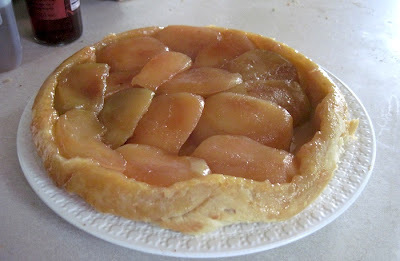 But whole wheat pastry flour makes more finicky dough than all-purpose flour, the type of apples is dramatically important where consistency is concerned, and caramelization is a highly sensitive process that if you're niggly about burnt spots requires stirring, flipping, and paranoia about how long to leave the pan on high heat. And so several seemingly unimportant details, glossed over by most recipes, become solidified into details that must happen. If knowledge is as I have just described it, a collection of immobile things, perhaps this is why I am not at all motivated to write another recipe now that I think I know what I'm doing where this tart is concerned. The previous recipe was in pursuit, and we've all heard those sayings about how it's all in the chase. It was a recipe of what I imagined should be done, an imaginative fiction of sorts. This recipe that I feel I should but don't want to write would be a history. Although I would make some minor changes: I would caramelize it for just a little longer. I would make sure there isn't a gap in the arrangement of apple slices. I would use a little less water in the dough (the crust was a bit tough). I suppose the point of writing the recipe down would be as an elaborate mimetic. Months or years from now I will have forgotten about all this, and the recipe should allow me to make the same tart again, even though without the recipe I won't remember how. Well, I still have one more round of dough in the fridge. I'll write the recipe after I make one more tart.